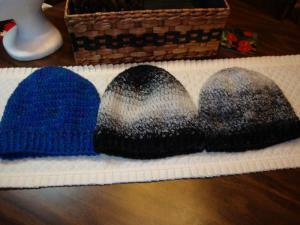 Here are 3 Slouchy hats & 1 scarf I made for my daughter. This year my daughter started showing some interest in hats. Until now she did not want to wear any hats or scarfs. My granddaughters still insisting they rather they rather freeze than wear hat or scarf. They live way North in WI, winters are very cold there. About that "Scarfie" yarn by Lion Brand. That is that shaded yarn. I bought many skeins of that yarn (first time-6 & 3). I have a nothing but trouble with that yarn. Like: missing that grey color (that medium color). Black just connected to white with a knot. Sometimes in more places than one in one skein. And it is VERY uneven when it comes to thickness. Out of first 6 skeins only one was perfect (no nuts or missing whole sections of color). Who knows , maybe I was just the only one out of Luck with that yarn. Most of the time I had to use 2 skeins to get one scarf. I had to get that missing color from the other skein or else that would look like was made out of yarn scraps (left overs). So I started making hats out of that left over yarn from that second skein that I took out one color. 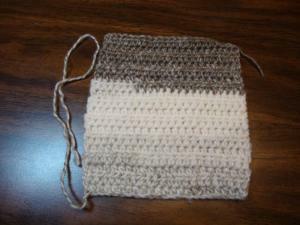 I did manage to make 2 more scarf's (1-black & 1-brown). I do not have pictures. That back/cream my friend took before I had a chance to take a picture. I still have that brown/cream, I forgot to take a picture of that one, I will. I still have couple more skeins in deferent colors (black/red, black/blue). I need to rewind them first and see WHAT kind of problems are in those skeins..? . PS: I made some headbands. I will post pictures later. They all turned out very nice. I can relate to your frustration. When I was making the ruffled scarves I got very aggrevated that out of probably 40 some skeins there were maybe like 3 that had no splices,many had more than one and one skein had 10. It amazes me how they do not put those skeins in the bargain bin. Love the hats and the scarf. It was worth your extra effort, because they turned out beautifully! Thanks for letting us know about that yarn's problems. I've looked at it a few times, but will now boycott buying it. We shouldn't have to go through that kind of effort with yarn. I hate when yarn is tied together inside a skein. I can understand if it happens once out of several skeins, but getting several sections knotted in one skein is ridiculous. It means that they're having manufacturing problems, which should be fixed before selling the yarn. Last time I had yarn with those kind of problems, I just got frustrated and never bought that yarn again. I wish I could remember which yarn it was, but I've got a few on my "never buy" list now. I wish I would have written the company and complained. Companies hate getting written complaints. Most will try to do something about it, to avoid hurting their reputation. They know that especially now with social media, they can't afford to ignore complaints. Please consider writing them an email. Have any of you written to Lion Brand about that yarn? Krys, I really think you should write to them and tell them exactly what you told us about the trouble you had with it! Hi Krys: Your scarves and hats are beautiful. I especially like the Black/White set. I too had the exact same problem with a hat and scarf I made my SIL in the Blue/Black Scarfie yarn. I had to use 2 skeins for the scarf because of so many knots. They turned out pretty and I still have about 5 skeins but just haven't had time to make anything. I liked working with the yarn but I probably won't be buying any more if the problem with knots persists. Thank You Ladies very much! Sharon Thank You very much:). Yes I think I will write a complain about that yarn to Lion Brand. Hello Reni, and Thank You very much for your compliment:). 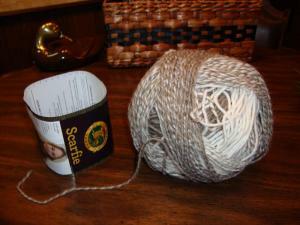 Remember to rewind that yarn before you start crocheting. So you will be able to see if there are any bad surprises.. .
That company - Lion Brand should NOT be selling that yarn that way. Since you been working with that yarn you could see where the problems are. In my case it is/was always in that "medium color-shade", that color I between light & dark. Because they did not figure it out HOW to make that work. That is: To "twist" those two colors together (that dark & very light color) to end up with that transitional color in between, in this case (picture above) it is gray shade. That part brakes on them contanly so in most of those cases they just trow awey that whole gray color part and connect that very light to very dark obviously with a knot. The knots would be bad enough in a scarf. BUT, to end up with a scarf that whole part is missing and it dos NOT look at those places like the rest of that scarf that is just unexceptional- UFWUL!. It looks like a scarf made out of scraps (in some places).They should be a shame of themselves putting something like that on a market. There is no dough in my mind that company knows about that problem. On top of all of that the thickness-weight of that yarn changes from #5 to about light #3 for many yards....and anything in between . So it is almost impossible to make that scarf the same size in width in every place. When I bought all that yarn I just wanted to make some scarf's as gifts for Christmas. Because of those problems I just made two of them before Holidays and give up on that at that time. 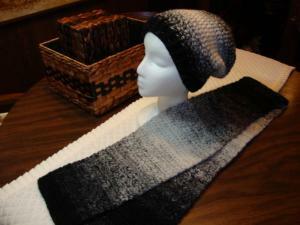 Acording to their info: 1 skein-1 scarf (big-long scarf). Wright now I forgot the size of that. Here is a picture of that problem. That was my first skein of that yarn. When I came to that problem I thought I will make a smaller scarf and start from the other end. Same thing happened again from the other end ( I will make a hat or two from that skein & other bad skeins..) From that time I started rewinding each skein. Hi Krys: I had the same problem on keeping the edges even and straight because of the size of the yarn changing periodically. 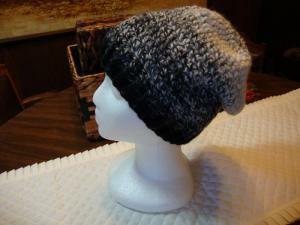 I didn't have as much trouble on yarn size with the hat. Wish I had taken photos before I gifted them. I checked and I have 4 skeins remaining so, when the time comes, I will use it up but not purchase again even though I like the way the yarn feels. I forgot mention all other problems because of that. That is: MANY hours wasted of my time for nothing. Like: crocheting for nothing with that first skein from both ends. The other skeins keep on rewinding & sometimes over again to get to the part (needed color) I needed to finish that scarf/scarf's. And a course weaving & securing all those ends so would not be visable, that takes time. And YES, money!. Not many scarfs (as planned). But many pieces left and that is unusable (maybe a toys for a cat? LOL). 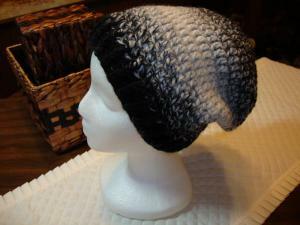 Or I would want to crochet another bad looking hat/hats. I do not think I want do that. I do not like that hat ( third picture on top). That first black/white hat was made out of few pieces too, that came out Ok. That second one black/white was made out of about dozen pieces of yarn. 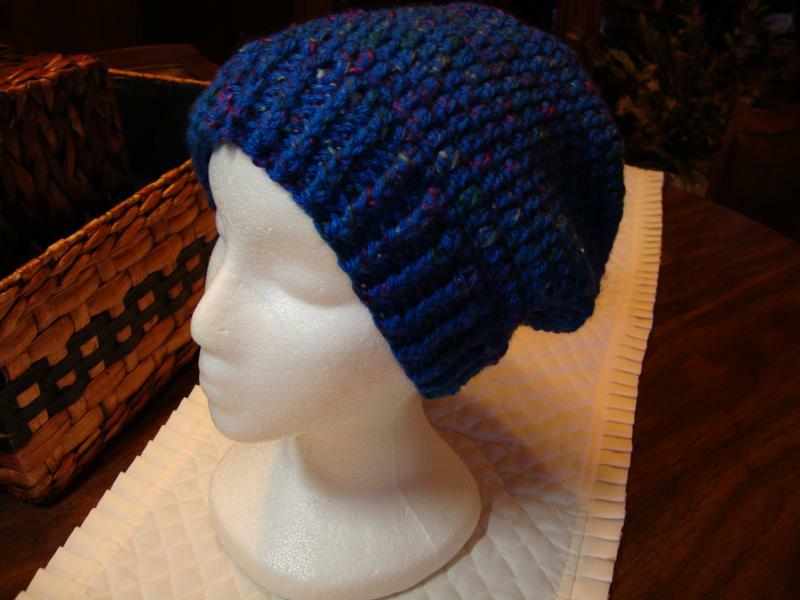 The colors do not work very well on that because I did not had much "choices" left of the colors I needed.. And to weave & secure all those ends... That took probably longer than to crochet that hat. As you can see I am really angry at that company for selling that to people. I still have couple skeins of that yarn left in bright colors:(. 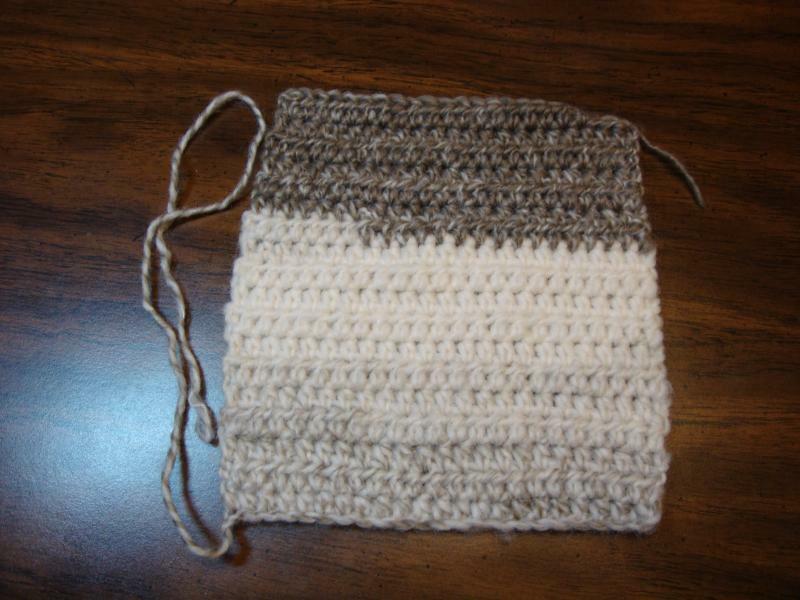 If they would put all that Scar fie yarn what is damaged in their factory (whole sections of one color missing in one or two places in each skein) to a bargain bins..?. They would not have almost any of that yarn left for sale on shelf's at reg. price LOL.. Because almost all of them are that way. Just think ...out of 6 skein's I bought, ONLY one good. Think of the percentage what would be left to sell as a good merchandize.